In Portland, we think of everything! It was whimsical and yet oddly practical if you needed to write a quick letter or even a manuscript. I typed a little bit until my fingers were too tired to continue. Remember when we all used manual typewriters? People poke fun of Portland as a little sister to Seattle or a wannabe European city but I think we are doing fine. Portland has it all and today even some sunshine! 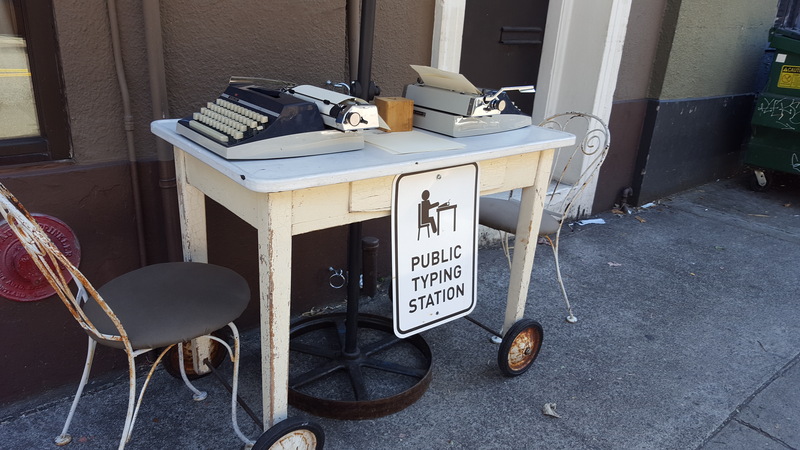 Posted on November 19, 2016 by lorigreerPosted in Living EverydayTagged friends, Humor, lifestyle, Manual typewriters, National Typewriter Day, Oblation Papers & Press, Pearl District Portland Oregon, Portland Oregon, Public Typing Station, Typewriters, writing. Aww that is wonderful to hear that your day is great…pretty much just taking it easy today…just made some hot coco lol…one of my faves …hehe.. Funny and a good attention getter! Thank you! I always liked the sound of the keys which were multiplied by record setting mistakes! I love walking by Oblation. Especially when I catch someone typing. Having the sun come out for awhile is wonderful. Thanks for reading & sharing! I think it is great that they set this up. What a fun nostalgic way to set up the ambiance. I want to visit Portland again! Have a lovely weekend! I’m happy to see this. There are young people out there who don’t even know what a typewriter is! So true. They have never seen them except maybe in an old movie. Fabulous! Love this generous and humorous idea. One of my college professors graded a paper as: story: A; typing: D-. He asked me to please not type my papers – he preferred my handwriting to the mess I managed to make with my little blue Olivetti manual typewriter. I am still an A-One lousy typist, even on a computer. My grandchildren are better than I am. Let’s hope the sunshine carries some warmth if you’re having to sit outside and look for the delete button. I love this idea. Different! I would certainly take advantage of it. Thanks for posting. Only people who write or find sitting and being creative would benefit but what a great challenge. Hugs! Lori! This is something to be inspired of. I think things like this should be displayed everywhere to get the taste of nostalgia. As time passes by we do not get to see the past things we used so much. To quote a few – Cameras, Clocks, Record Players, Printing Machines, and the like. I just loved it Lori, thanks. This is the most awesome thing I have ever seen. Unfortunately, I’m not that good a typist, but I would fly to Portland just to sit down at that station. Brilliant and inspiring. I’m having all sorts of ideas. Ha ha ha. I love Portland. Where else would this crop up? I remember typing ALL of my college notes on an old manual. I thought electric typewriters were the ultimate invention. What a great idea! My husband had a job relocation and we moved to Downtown Portland last summer. We are constantly amazed by all of the unusual things that we find walking around the city. Portland is certainly never dull. I think it’s a great idea. One would have to search for a manual typewriter. After using a computer soft keyboard, I find it hard to type on a manual. Thanks for reading and commenting. Cheers from Portland, Oregon.